The Tinwife's award-winning, Bernard Herrmann-inspired original score is now available for download via iTunes, Spotify, Amazon, and Google! More about composer Zak Millman. After a year on the festival circuit, The Tinwife will make its FINAL screening at the Festival International du Film d'Aubagne!!! The festival, which is located in the south of France, annually showcases and celebrates 80 shorts from around the world that exhibit a strong relationship between film and music. It's an honour to be selected and we're so very happy that we get to close out our absolutely-pure-magic tour at such a stunning and unique festival. The Tinwife will play in the Program 4 shorts block alongside the Oscar-Nominated short WATU WOTE. The Tinwife is playing Boston! Look for us this February at the Boston Sci-Fi Film Festival - an 11-day cinematic event held at the historic Somerville Theatre. The 2018 edition marks the festival's 43rd anniversary as the oldest genre fest in America. The Tinwife will be screening alongside a group of shots in the Refulgent Collapsar program. We're so very excited to announce that The Tinwife has won BEST NORTH AMERICAN SHORT at the Buffalo Dreams Fantastic Film Festival!!! Thank you once again to the entire cast & crew and everyone who has supported the film and helped make the The Tinwife and its festival run such a success! The Tinwife is an official selection of the Victoria Film Festival in Victoria, BC!!! VFF is the largest showcase of independent films on Vancouver Island and one of Canada's preeminent festivals, screening more than 100 films over 10 days. We're excited to be sharing the screen with some next-level shorts from all across Canada! We're so very honoured to announce that Anna Mazurik has received the Best Actress in a Short award at Other Worlds Austin in Austin, Texas!!! Anna's outstanding and brilliant performance has electrified audiences all over the festival circuit and has made The Tinwife the success that it is today. We'd like to thank Anna for everything she's brought to the film, her super-atomic-level dedication, and all-around cool attitude!! We're so very honoured to announce that The Tinwife received a Special Jury Award and Technical Achievement Award (for Production Design) at this year's Saskatchewan Independent Film Awards!!! We'd like to thank everyone who helped make The Tinwife and give a special shoutout to our brilliant and outstanding Production Design Team (Nicole Zalesak, Jennifer Machnee, Rebecca Boese, Alyssa Karpinka, Rissa Weitzel, Audra Balion, and Kelly Sauder) who worked tirelessly to bring The Tinwife's retro-future universe to life! The Tinwife is an official selection of Other Worlds Austin!!! Other Worlds is one of the premier sci-fi film festivals in the US, championing filmmakers and writers and bringing the best films to Austin, Texas. We're so very excited about this selection and can't wait to screen at another fest with FilmQuest alums Three Skeleton Key and The Ningyo! The SIFA - Saskatchewan Independent Film Awards nominations were just announced this morning and The Tinwife has been nominated for Technical Achievements in Cinematography (DOP and Colourist Devin McAdam) and Production Design (Travis Neufeld) as well as another Best Acting nomination for Anna Mazurik!!! We're excited and honoured to be nominated and look forward to an incredible night of #SKFILM! Congrats to all of the nominees! We're so very honoured to announce that The Tinwife has been nominated for 4 awards between the Chilliwack Independent Film Festival and the Buffalo Dreams Fantastic Film Festival!!! Award nominations include Best Short Film, Best Actress (Anna Mazurik), Best Score, and Best North American Short Film. Thanks again to everyone who helped make The Tinwife a reality and to the festivals for their generous consideration! The Tinwife is an official selection of the Buffalo Dreams Fantastic Film Festival!!! Buffalo Dreams is an 11-day festival that features over 100 independent films from around the world. We're honoured to be part of this fest and finally play on a screen in NY! Stuart Anderson from 5D Blog reviews The Tinwife. Read the full review here! Excited to announce the The Tinwife is an official selection of the Chilliwack Independent Film Festival!!! Nestled within the heart of BC's Fraser Valley, the festival is a two day event with screenings and Q&A's designed to provide opportunities for both local and international filmmakers to showcase their work and build contacts for future collaborations. Our review from the Saskatoon StarPhoenix has just landed! Read it here! Check out the photos from our SOLD OUT local premiere in Saskatoon! Thank you so much to everyone who came out and dressed up in their 1950s best! See more photos from the event, including the red carpet pics on our Facebook Page. The Saskatoon Premiere is SOLD OUT! Thank you so much to everyone who came out to support the film! You are amazing Saskatoon!!! See you all on the 30th! We've just added TWO more screenings to our September schedule!!! Catch The Tinwife at both the Ottawa Spookshow and Fantastic Film Festival and the Fargo Fantastic Film Festival this weekend! 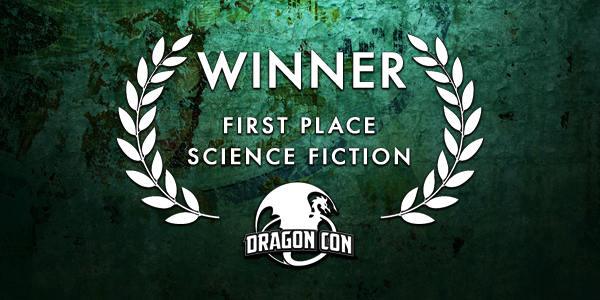 We're so very honoured to announce that The Tinwife has been awarded FIRST PLACE SCIENCE FICTION at the Dragon Con Film Festival in Atlanta!!!! We couldn't be more excited about this and proud to have screened alongside some of the most awe-inspiring genre short films on the circuit! Thanks again to the entire cast & crew and everyone out there who has helped make the The Tinwife and its festival run such a success! Team Tinwife just returned from a weekend full of incredible genre films, Mormon temples, and waffles! FilmQuest is one of the absolute best fests we've been to and the block films we played with was absolutely brilliant. We didn't take home any Cthulhu awards, but we slayed on the red carpet and met some unbelievably talented filmmakers. Who knew Provo was so cool? We are so very honoured to announce that The Tinwife is an official selection of the International Film Music Festival of Tenerife (Fimucité) and has been nominated for Best Original Score in a Short Film!!! Situated in Spain's Canary Islands, Fimucite is one of the largest and most well-respected Film Music festivals on the circuit! This year, the festival has selected only 20 short films out of its 1,200 submissions.